My pictures of the Quiraing on the Isle of Skye feel somewhat never ending at this point, but in a good way if that makes any sense. 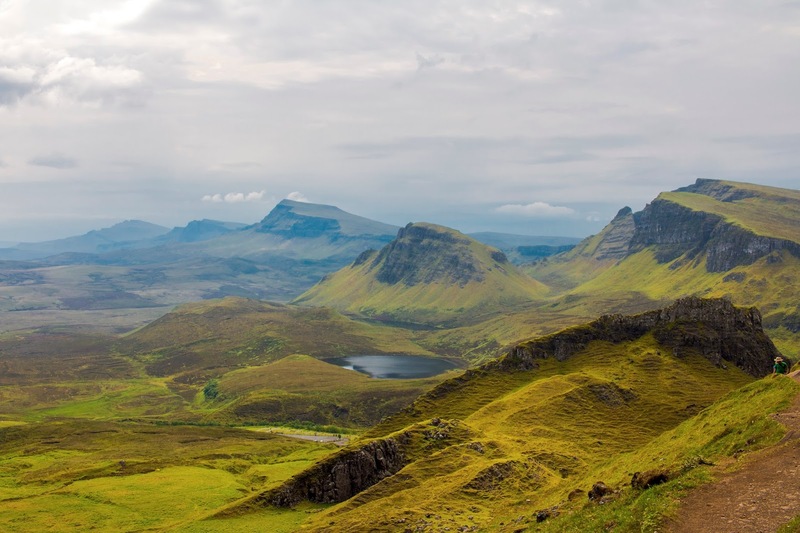 I did a whole post on the Quiraing back in June. I'm still shifting through them and finding new ones to edit. My hike to the Quiraing was one of the most magical parts of the trip. Between the rich colors, sharp cliffs, and misty, overcast weather, the setting felt like a fantasy world come to life. But, I had a lot of trouble capturing that on camera. With a narrow path and approaching storm, the shots I got were hurried. My white balance was way off, and I couldn't quite find the right shutter speed. The photos I ended up with were disappointing. The hills in my pictures lacked the deep golds and greens that I could see with my eyes, the misty sky looked over exposed and the beautiful quality of light was completely invisible. Thank the Lord for raw photographs. The first thing I did when we got back from our trip was to sit down at my computer and open up a photo of the Quiraing in Photoshop. With a few quick adjustments I had matched the scene in my picture to the one I so vividly remembered from my trip. RIP beautiful pictures of Edinburgh at sunset. We hardly knew ye.